Nuclear weapons "are incompatible with the values upheld by our respective faith traditions", representatives of some 50 Christian, Buddhist, Muslim and Jewish organizations have said. The inter-religious statement came on May 1 in a joint call to the 191 governments participating in the world's largest disarmament treaty. The call, co-sponsored by the World Council of Churches, was made during civil society presentations to the Nuclear Non-Proliferation Treaty (NPT) Review Conference in New York City. "We raise our voices in the name of the shared values of humanity. We reject the immorality of holding whole populations hostage", says the statement delivered at the United Nations by Emily Welty, vice-moderator of the WCC Commission of the Churches on International Affairs. "There is no countervailing imperative that justifies the continued existence [of nuclear weapons], much less their use", Welty said. The signatories, from Europe, Asia and North America, pledge to make their respective faith communities more aware of the inhumane nature of nuclear weapons. They urge governments to heed the voices of atomic bomb survivors and to begin negotiations to prohibit nuclear weapons "in a forum open to all states and blockable by none." The 70th anniversary of the atomic bombings of Hiroshima and Nagasaki during World War II looms large over this year's NPT conference. 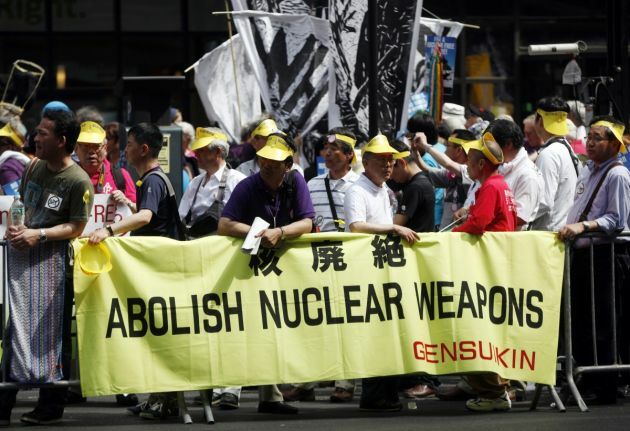 In plenary sessions, seminars and at a large public rally, aging survivors of the atomic attacks - most already in their 80s - reiterated their calls for nuclear abolition. Many of the remaining survivors may not be able to attend the next NPT review conference in 2020. Since the last NPT review in 2010, new evidence about the catastrophic humanitarian, environmental and other effects of nuclear weapons has deepened the divide between the few world powers with nuclear weapons and those 186 states that have pledged never to have them. Momentum is growing, with active support from civil society including churches, for the non-nuclear majority to promulgate a ban. WCC member churches and partners on six continents have asked their governments to demonstrate their support for such a ban at the current NPT conference.